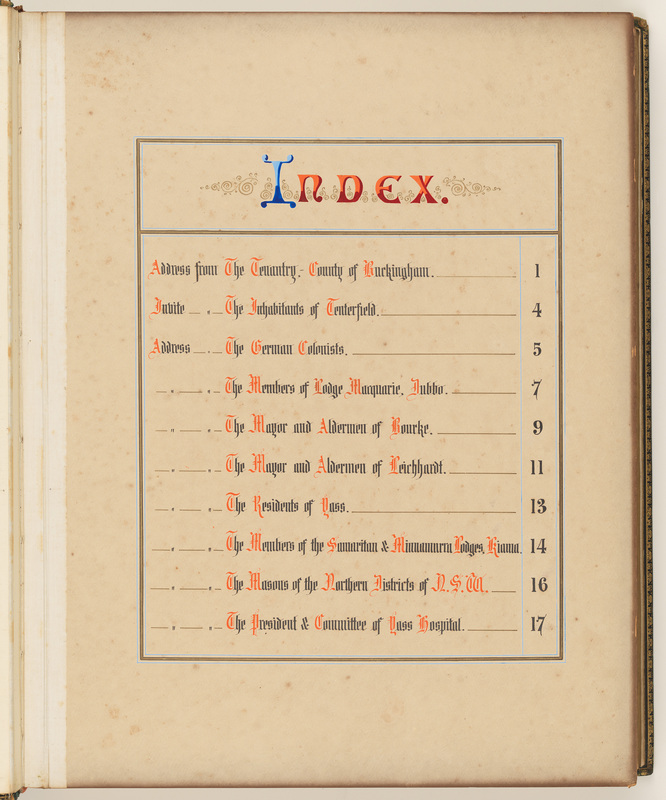 On 2nd January 2014 State Records NSW received 22 Presentation albums from the Centre for Buckinghamshire Studies in Aylesbury, Buckinghamshire, United Kingdom. 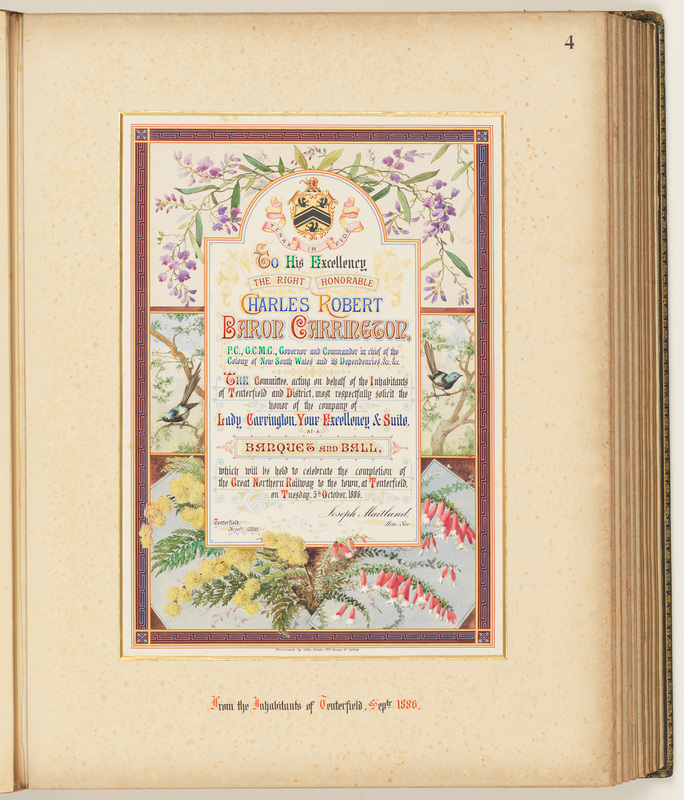 The 13 albums contain illuminated addresses that were presented to Charles Robert Carington* (1843-1928) during his tenure as Governor of New South Wales from 12th December 1885 to 3rd November 1890. 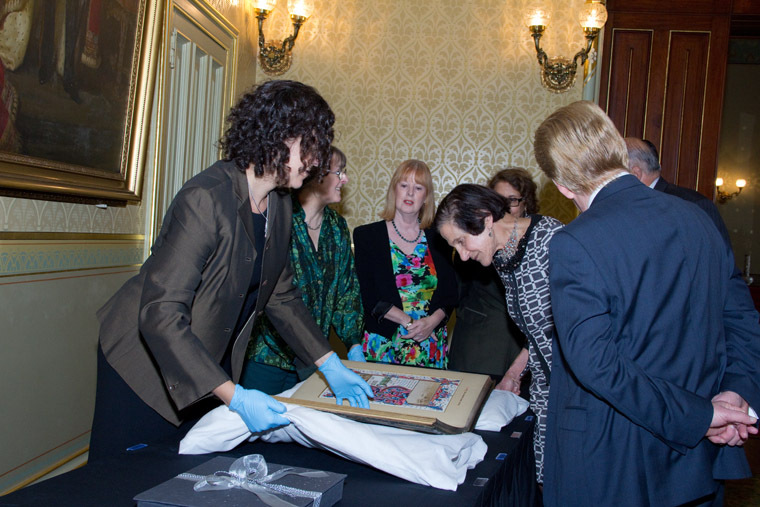 The Carrington Volumes were officially handed over to the NSW Government by a representative of the Carington Family, Janet Holmes à Court. 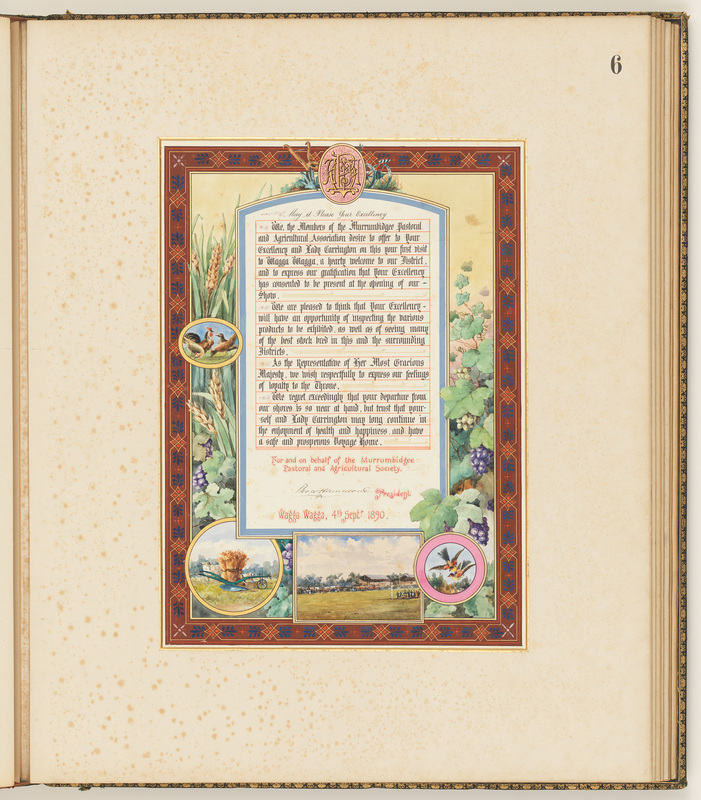 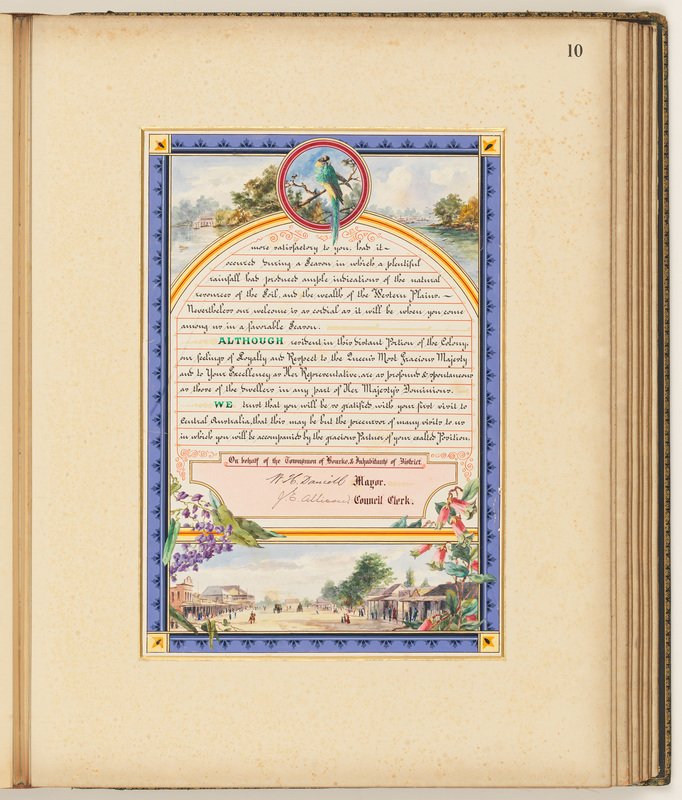 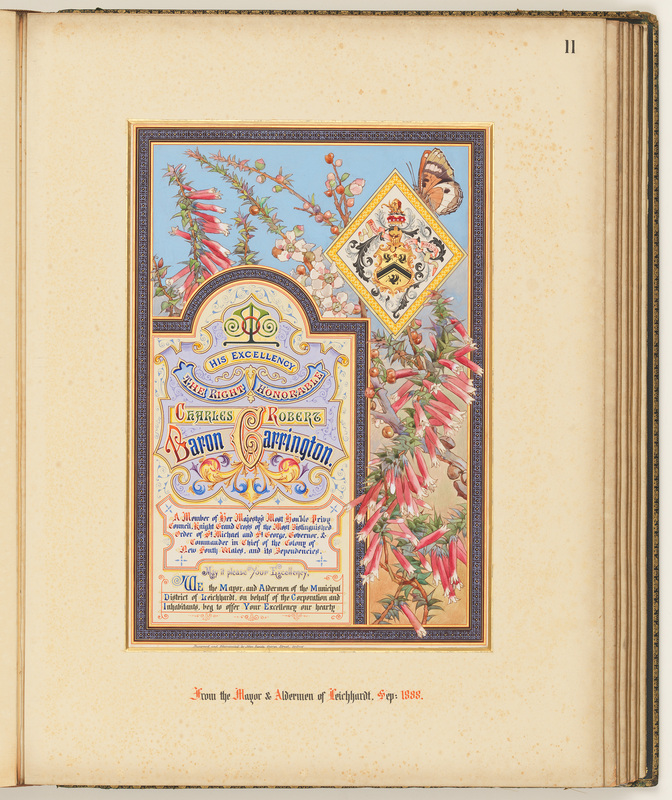 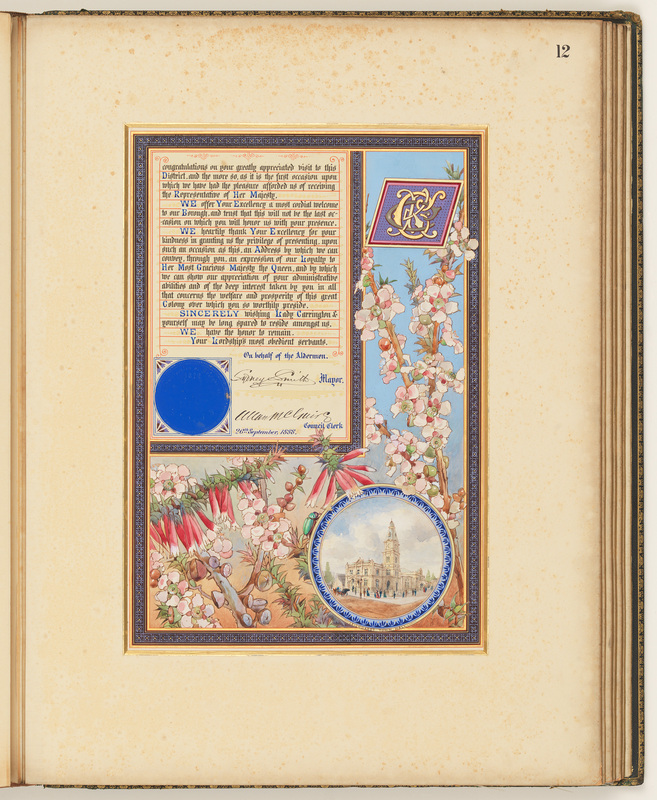 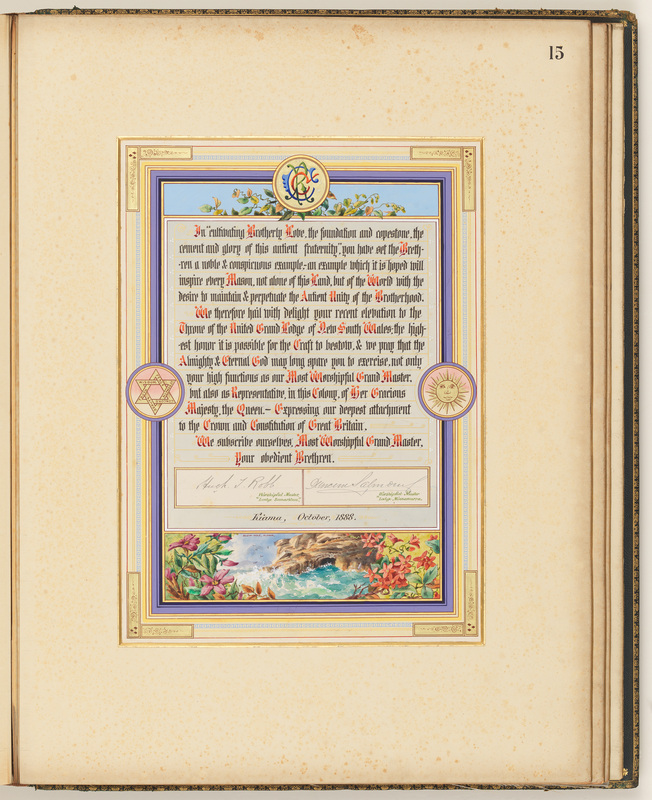 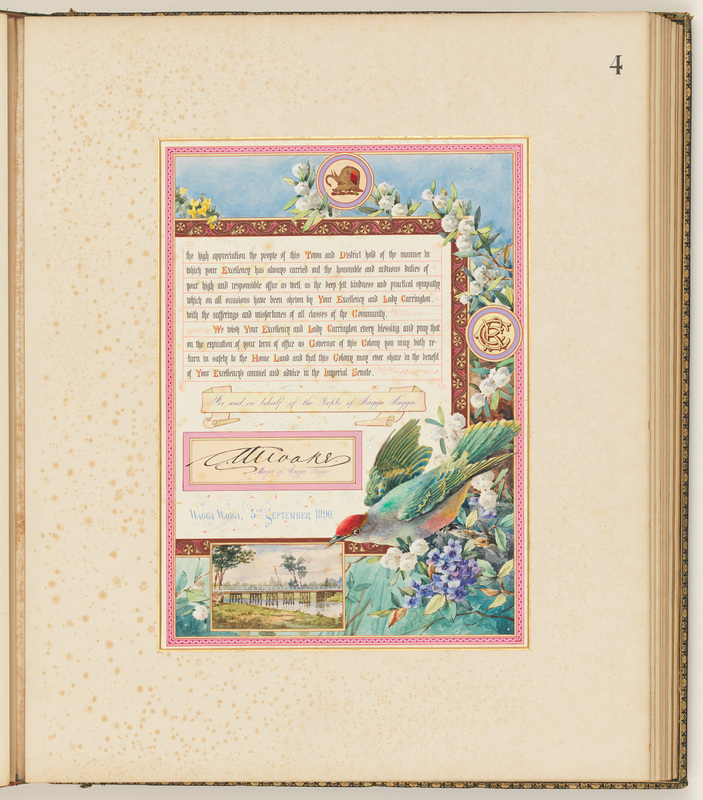 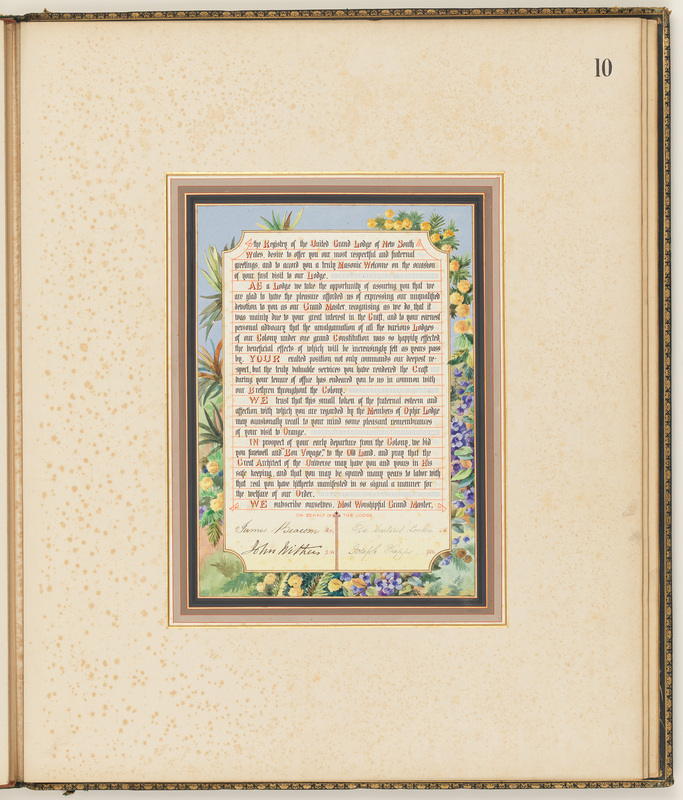 This ‘most auspicious’ appointment attracted much ceremony in NSW and as a consequence saw the creation of highly decorative illuminated addresses and photograph albums to be officially presented to the Governor. 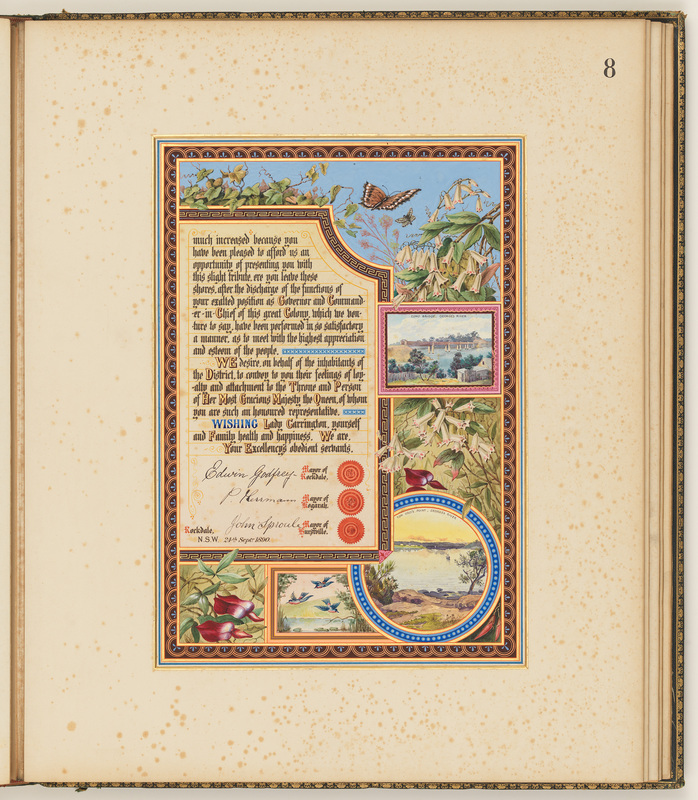 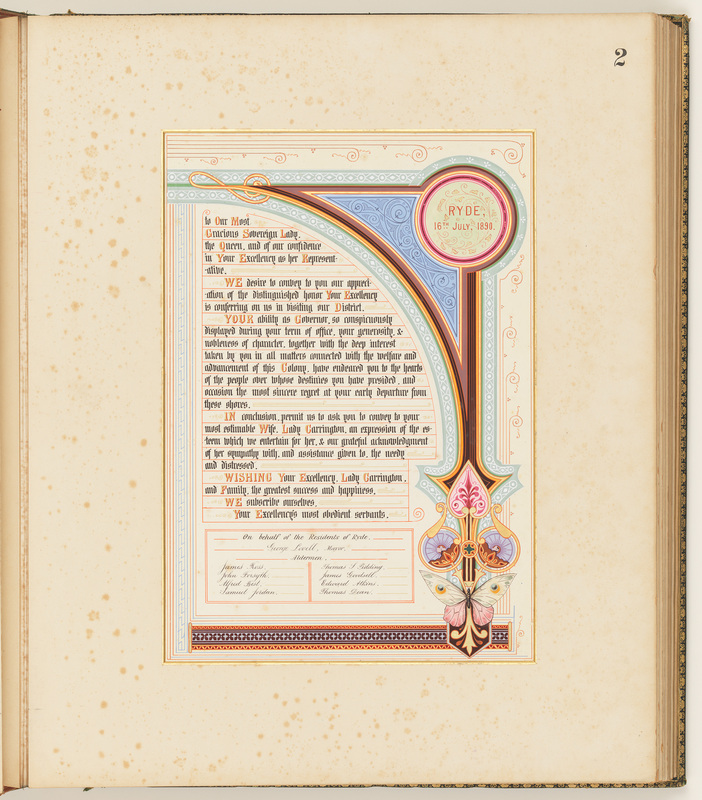 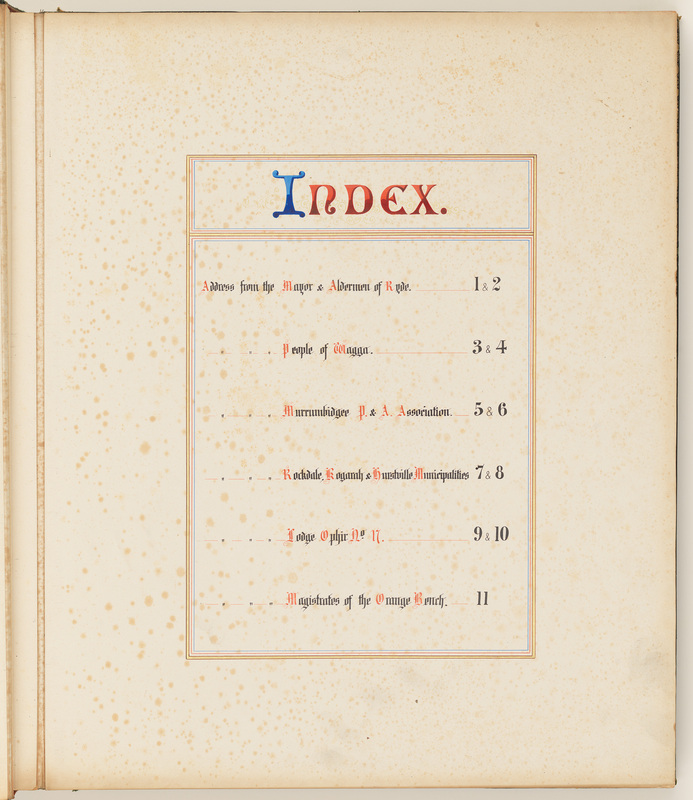 All the albums feature tooled leather binding, gilt edged pages, and cloth hinged leaves. 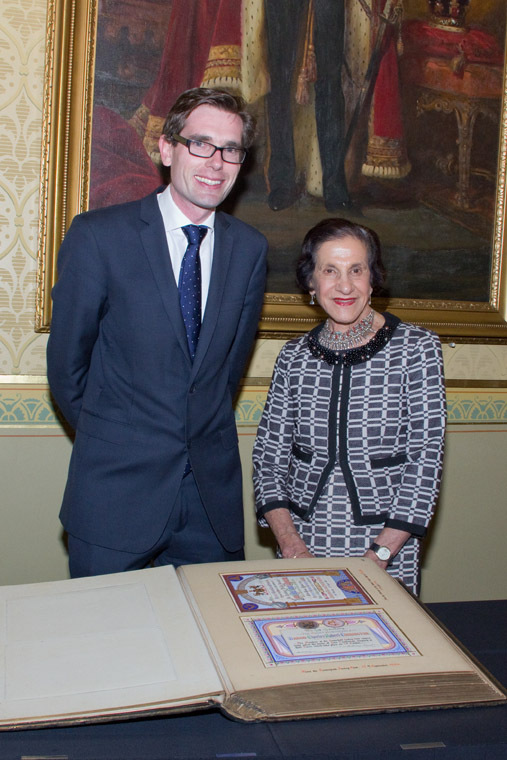 Minister for Finance and Services, Dominic Perrottet, today joined Governor of New South Wales, Her Excellency The Honourable Marie Bashir, at Government House to receive a gift of historic volumes from the family of Charles 3rd Lord Carrington, former Governor of New South Wales from 1885 to 1890. 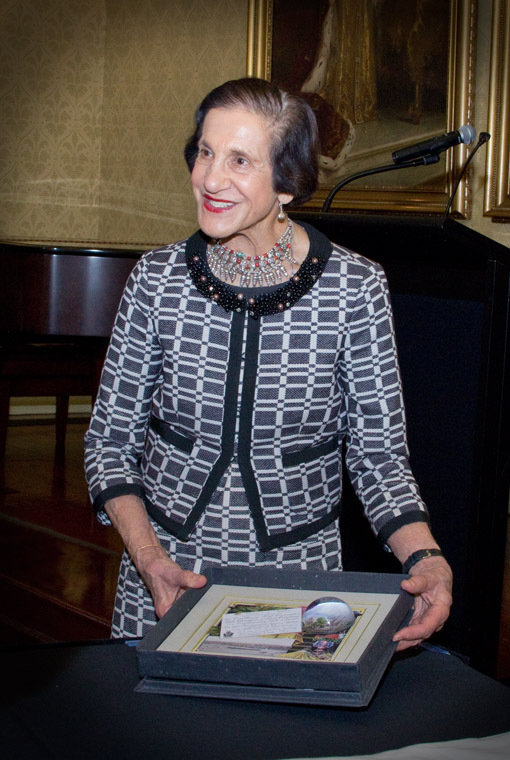 “I am thrilled to have been able to join Governor Bashir in receiving such a historic gift from the Carington Family on behalf of State Records Authority of NSW,’ Mr Perrottet said. 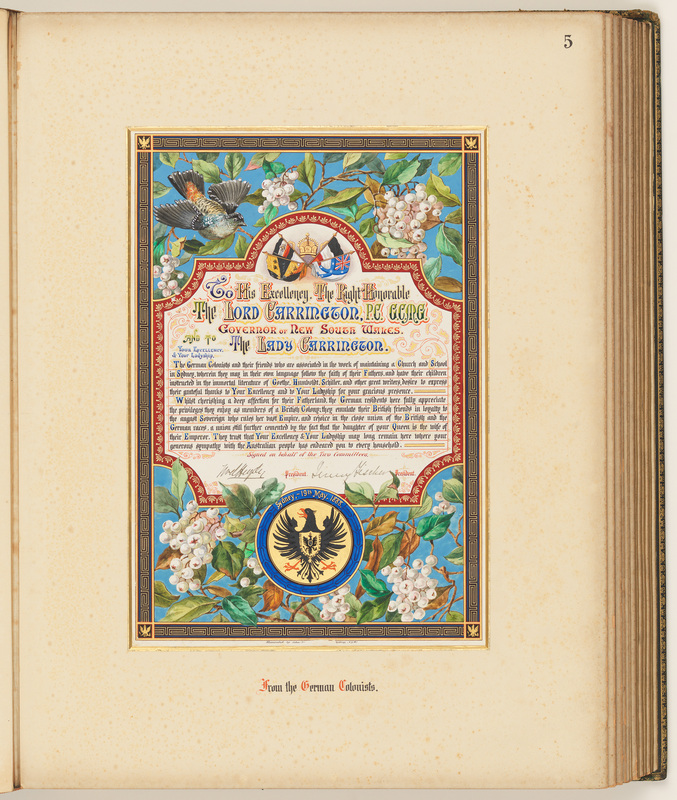 “Dating back 122 years, this collection of 22 exquisite volumes provides a unique insight into the life and conditions within colonial NSW. 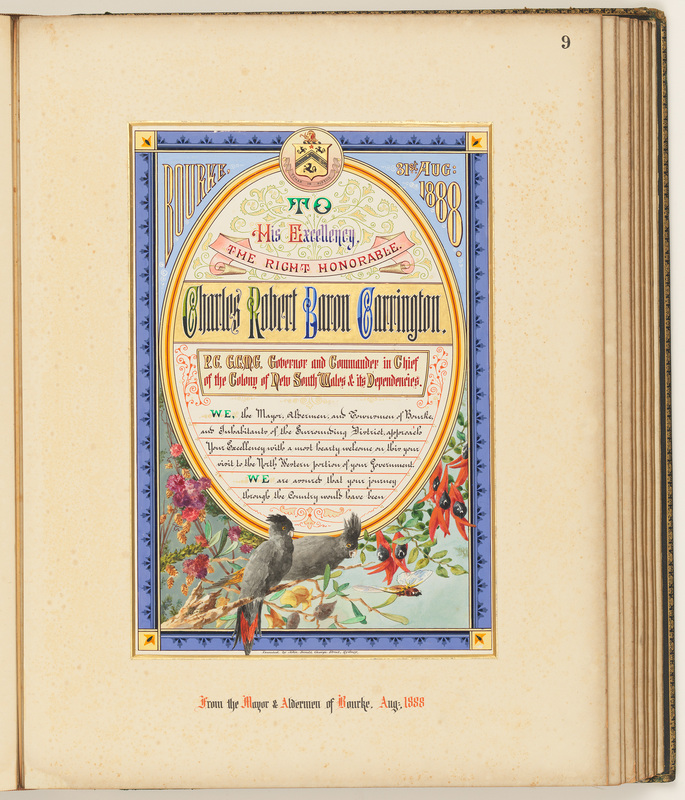 The Carrington Volumes accompanied Lord Carrington back to England in 1890, where they remained in Buckinghamshire until now. 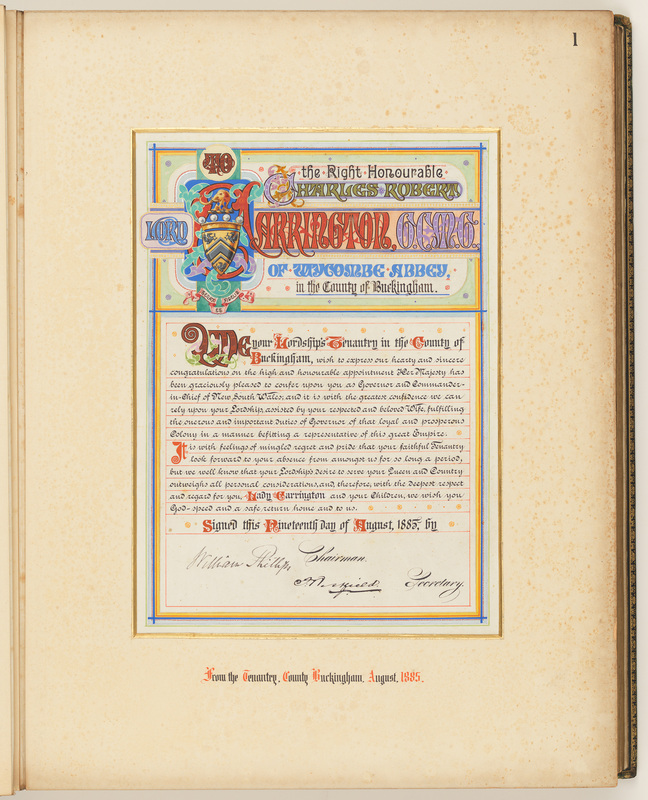 They have been donated to NSW State Records by the Carington Family and the Centre for Buckinghamshire Studies. 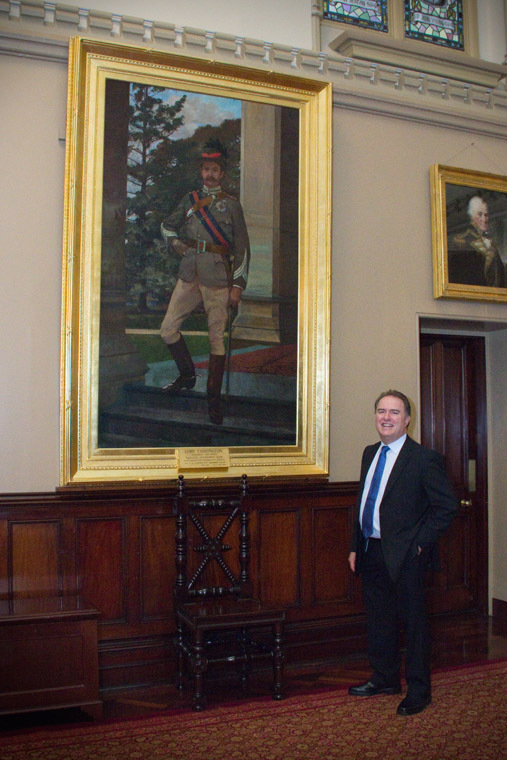 The Honourable Rupert Carington, descendant of Charles 3rd Lord Carrington, said the family had retained special ties with Australia. 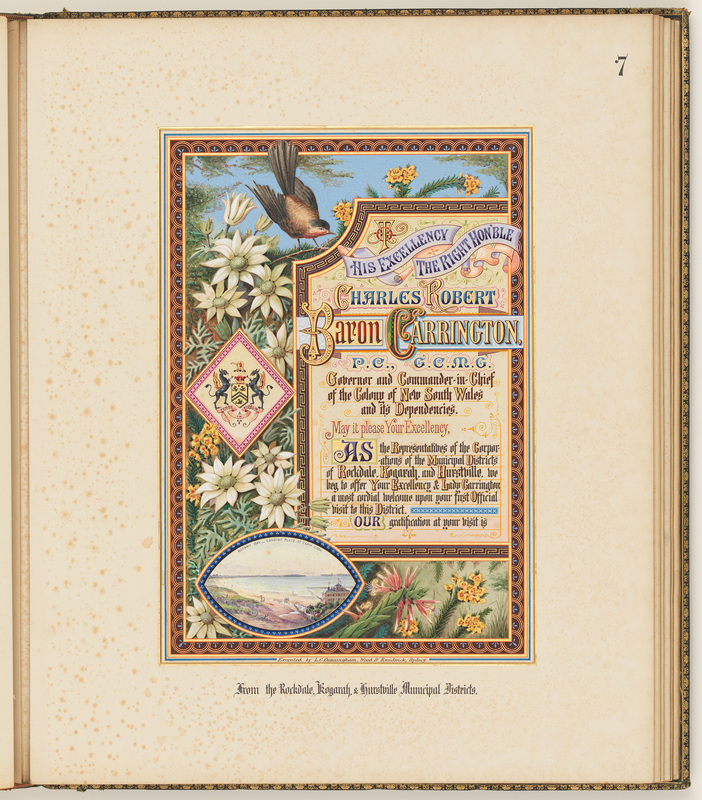 “The Carington family greatly values its connection with Australia,” he said. 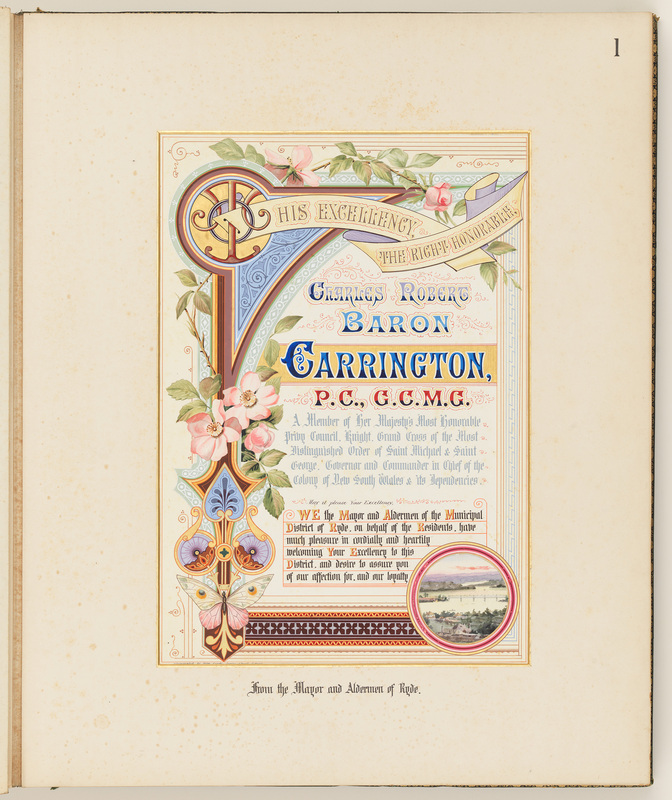 “Apart from Charles 3rd Lord Carrington being Governor of NSW, Rupert 4th Lord Carrington lived in NSW, married an Australian, and raised a regiment in Australia to fight in the Boer War. 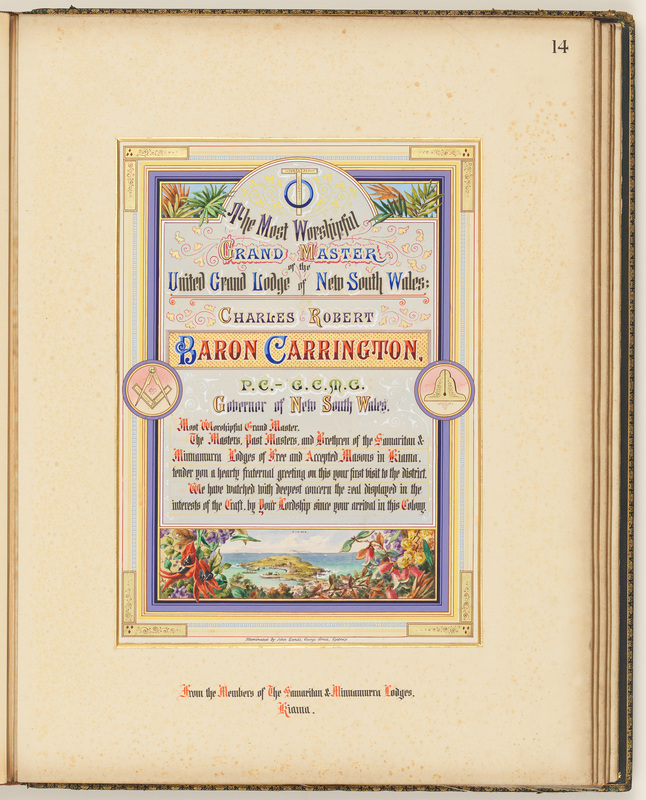 Rupert 5th Lord Carrington was born in NSW, and my Father Peter 6th Lord Carrington was British High Commissioner in Australia. 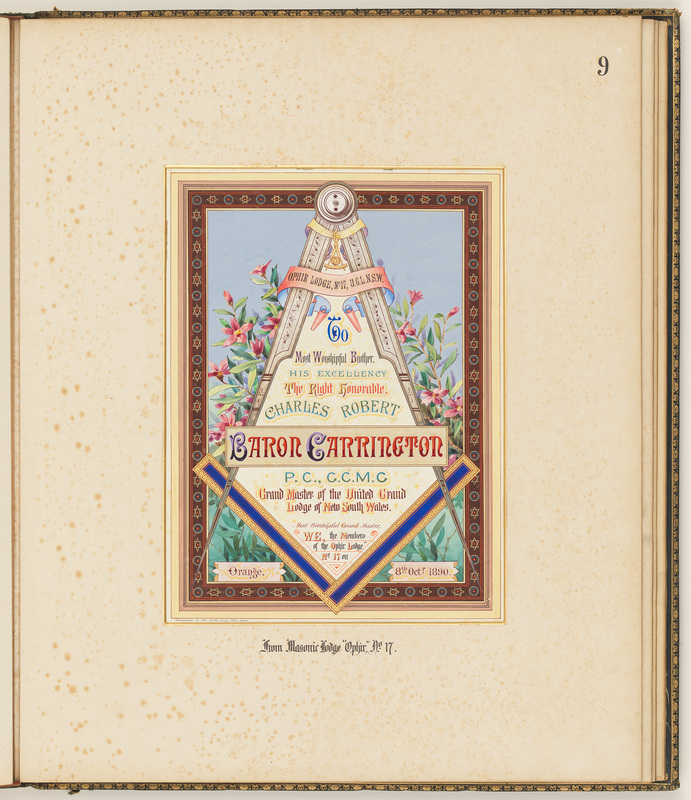 Minister Perrottet said work had commenced to digitise the Carrington Volumes and to make them available on the NSW State Records website, www.records.nsw.gov.au. 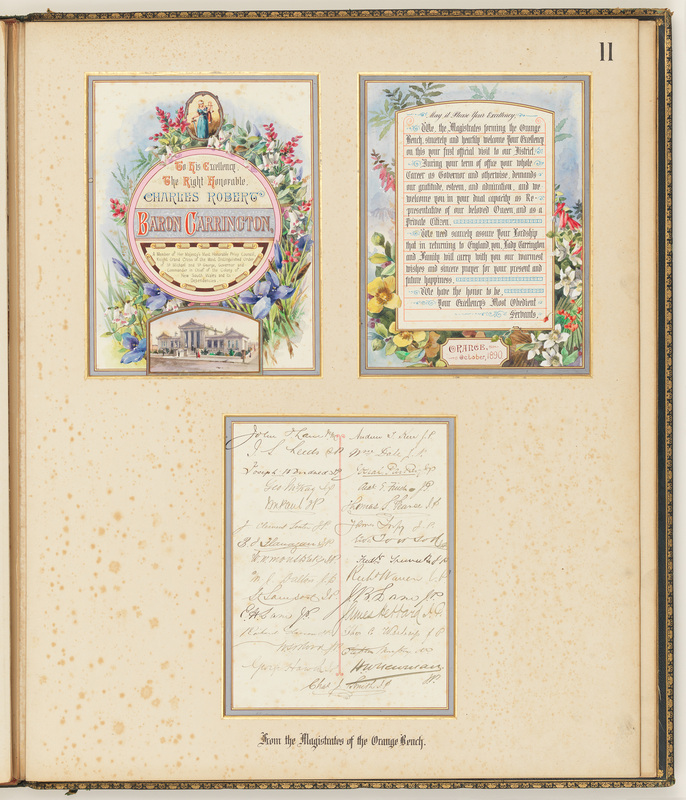 “We want to make our state’s records as easy to access as possible, and making these beautiful volumes available online in digital format will mean everyone has a chance to view them,” he said. 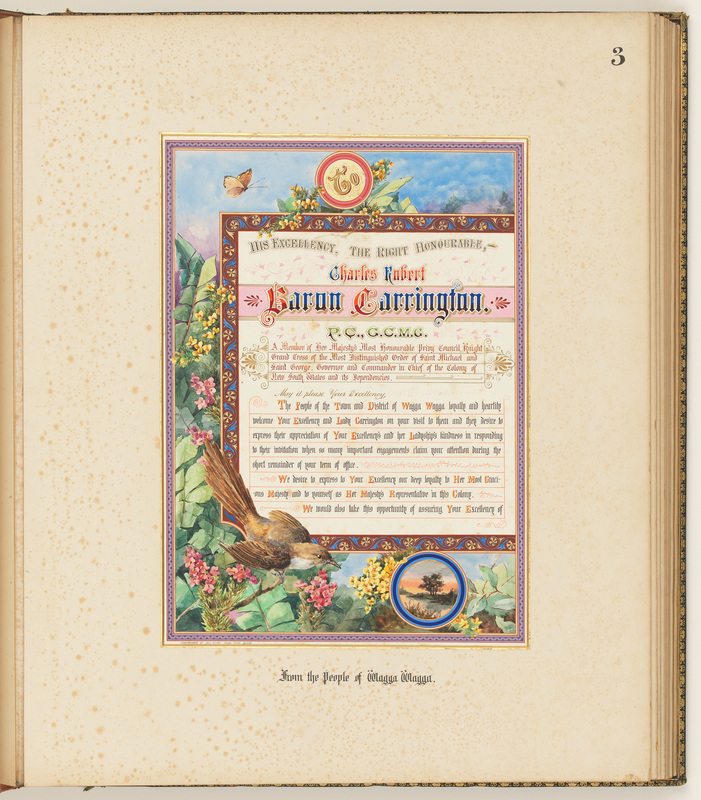 *Please note the Carington family name is spelled with one ‘r’ while the title Lord Carrington is spelt with two ‘r’s. 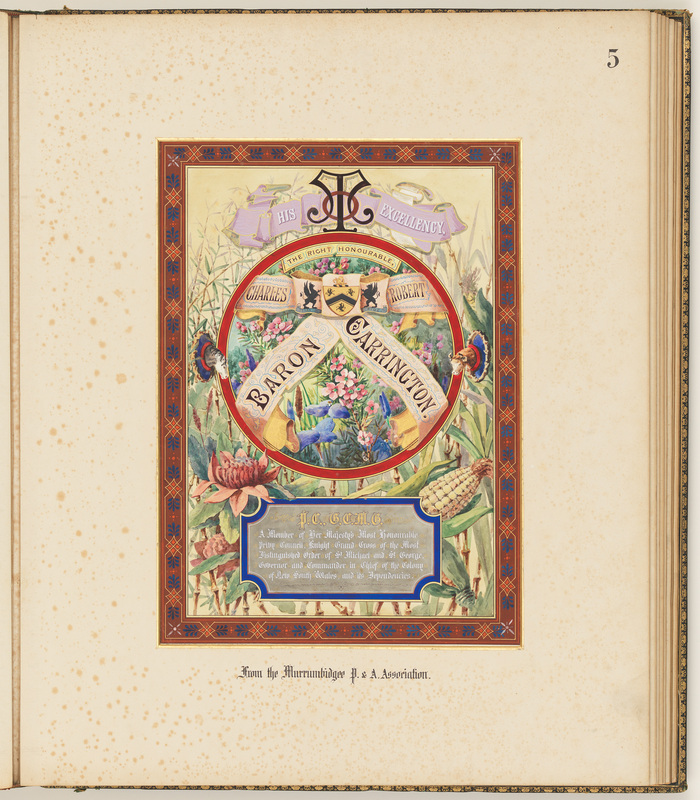 These albums were digitised by the State Library of NSW. 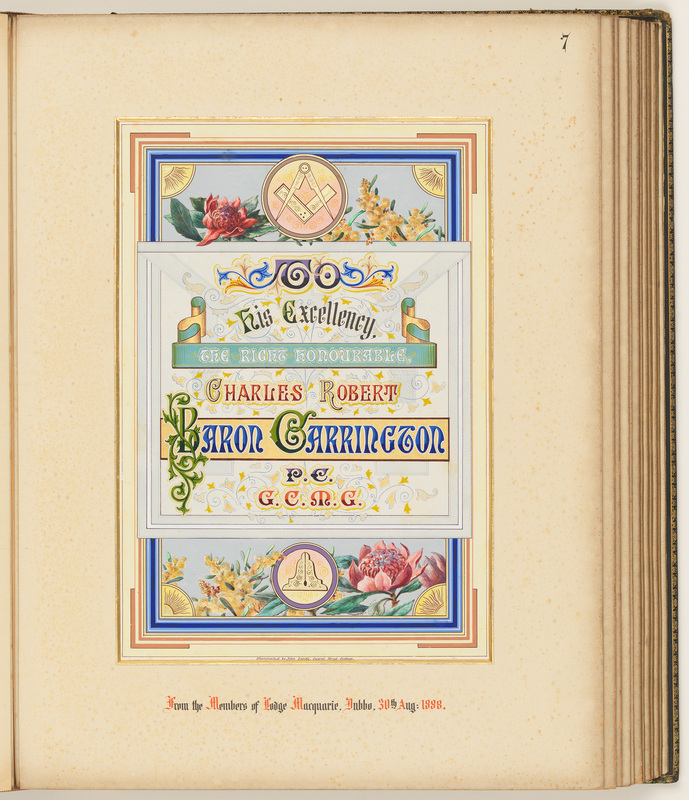 A. W. Martin, ‘Carrington, Charles Robert (1843–1928)’, Australian Dictionary of Biography, National Centre of Biography, Australian National University,http://adb.anu.edu.au/biography/carrington-charles-robert-3169/text4745 , accessed 14 January 2014.